Jean Parker was one of the attendees at the 1956 get-together held in Sandusky, Ohio. Sandusky tattooist Al Schiefley had struck up a friendship with Bristol, England tattooist Les Skuse in the mid 1950s. The story goes that when Les Skuse started his Bristol Tattoo Club in the mid 1950s he got a lot of press in the European papers. That news story hit the news wire and was picked up by several US newspapers. Al Schiefley saw the article and started corresponding with Skuse. This led to a solid friendship, with Schiefley traveling to England to visit Skuse in 1955 and being the guest of honor for a Bristol Tattoo Club meeting. 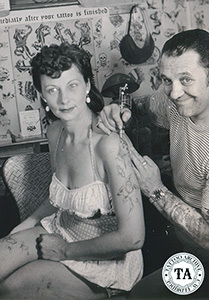 In 1956 Skuse visited Schiefley for a meeting of the Sandusky Tattoo Club. This Ohio get-together included Les Skuse, Al Schiefley, Paul Rogers, Huck Spaulding, D.C. Paul and others.